The School of Law of Addis Ababa University in collaboration with Northwestern Bluhm Legal Clinic is holding its 4th Annual National Conference and Training on Clinical Legal Education from March 20-22, 2019 at Ghion hotel Addis Ababa. Dr. Solomon Negussie, Dean, College of Law and Governance Studies, AAU, in his welcoming remarks noted that the college has three academic units and all the units engaged in community services and strongly attached to the public sector programs of the government; specially the law school is rigorously working on the legal reform programs that is going on in the country. Dr Solomon further noted that the school has six legal aid centers in Addis Ababa and surrounding areas and also planning to expand the service beyond Addis Ababa areas. Dr. Gedion Thimothewos state Minister, Federal Attorney General in his keynote speech said, “Addis Ababa University and other Universities throughout the country have been providing legal aid services that have been contributing greatly to the expansion of access to legal aid and council. This annual conference has become an important platform for those law schools all over the country to come together and share their experiences as well as challenges and such interactions are helpful in enhancing the quality of legal aid and clinical education across the country.” Dr. Gedion also noted commitment of the government of Ethiopia and the office of Attorney General to support and strengthen the effort law schools to provide access to legal council to all. The conference also features scientific paper presentation by scholars who come from Northwestern Bluhm and different Ethiopian universities on Legal Clinic, Clinical Legal Education Method and Models and Negotiation, Ethics, Externships and assessment. 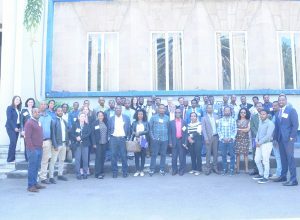 This training and conference was organized with the objectives of exposing Ethiopian law faculty to simulation based, live client, models, concepts of faculty clinicians as practitioners and supervisors of students, discuss interactive teaching methodologies using previously developed case files, and explore the tension between the role of law schools in providing legal aid and effective clinical instruction and discuss opportunities and challenges facing clinical legal education in Ethiopia.